Baby allergies and sensitivities has become a growing concern. The focus of this section is environmental allergies. Food allergies are also common among young children and are sometimes outgrown. We will address food allergies in our section on Feeding Baby. According to the American Academy of Pediatrics, 1 in 6 kids have some type of allergy triggering their immune system to overreact and producing sneezing, coughing, a runny nose, itchy eyes and what may seem like a permanent cold. They have been linked to sinusitis and asthma. While most allergic reactions are simply uncomfortable, some allergic reactions can be severe and even fatal. Overall, allergies can be successfully managed. How do babies get allergies? Scientists think both genes and the environment have something to do with it. Normally, the immune system fights germs. It is your body's defense system. In most allergic reactions, however, it is responding to a false alarm. Allergic rhinitis commonly known as hay fever or seasonal allergies and symptoms include nasal stuffiness, sneezing, nasal itching, clear nasal discharge, and itching of the roof of the mouth and/or ears. A child may experience a drug allergy causing anaphylaxis, a severe allergic reaction causing constriction of the airways, resulting in wheezing, difficulty breathing, and gastrointestinal symptoms such as abdominal pain, cramps, vomiting, and diarrhea. This is a potentially life-threatening reaction and medical help should be sought immediately. Latex allergy is an allergic response to the proteins in latex rubber. The most common symptoms are hand dermatitis, eczema, hives, sneezing and other respiratory distress. Insect bites and stings from bees from hornets, wasps, yellow jackets, fire ants and harvest ants commonly cause reactions that can vary from minor skin irritation to anaphylactic shock. Eczema and skin allergies are chronic or recurrent inflammatory skin disease characterized by lesions, scaling and flaking is common in children due to sensitivity to a number allergens. Allergic Conjunctivitis more commonly known as itchy, watery eyes, is one of the most common eye allergies and is often found in combination with skin allergies. 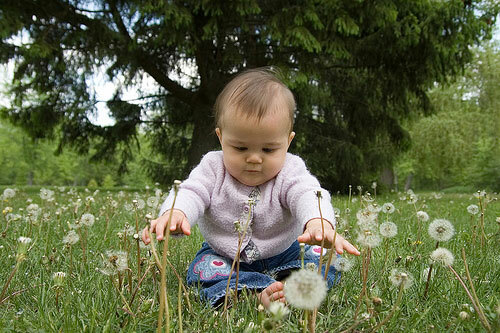 Avoidance of known allergens is the best route to avoid baby allergies. As they say, an ounce of prevention is worth a pound of cure. For occasional symptoms, oral anti-histamines are the most common class of medications used for childhood allergies. Many are available over the counter. They are inexpensive and can be taken only when needed. Oral decongestants, with or without oral anti-histamines, are useful medications in the treatment of nasal congestion in children. Nasal steroids are excellent at controlling baby allergy symptoms such as sneezing, runny nose and nasal congestion however, the sprays need to be used daily for best effect. Side effects tend to be mild and limited to nasal irritation and nose bleeds. Parents should discuss the potential side effects of nasal steroids with their child’s physician. Allergy shots, or immunotherapy, have been shown to be particularly helpful in childhood allergies. These are not typically considered in children less than 5 years of age, so they are not the best solution for baby allergies. The following suggestions could significantly reduce the number of allergens in your home, thus reducing symptoms and the need for treatment. > Hot, humid houses are breeding grounds for dust mites and mold. Keep the thermostat at 70 degrees Fahrenheit and humidity between 30% and 50%. Clean or replace small-particle filters in central heating and cooling systems and in room air conditioners at least once a month. > Keep your doors and windows closed during warm weather and use air conditioning and dehumidifiers to prevent the development of mold. Clean washable material with a solution of 5 percent chlorine bleach and wear a protective mask when cleaning away mold. > Damp-mop wood or linoleum flooring and vacuum carpeting. Use a vacuum cleaner with HEPA filter. Use a damp cloth to clean other surfaces, including the tops of doors, windowsills and window frames. > Don't allow smoking anywhere inside your house. > Remove anything that collects dust, such as knickknacks, tabletop ornaments, books and magazines. Keep your child’s toys, games and stuffed animals in plastic bins. > If you can't find a new home for your dog or cat, at least keep it out of the bedroom. Bathing pets at least twice a week may reduce the amount of allergen they shed. > Choose an air filter that has a small-particle or HEPA filter. Cover pillows, mattresses and box springs in dust-mite-proof covers. Wash sheets, pillowcases and blankets at least once a week in hot water. > Remove carpeting and use hardwood or linoleum flooring. Using these tips can help avoid baby allergies.